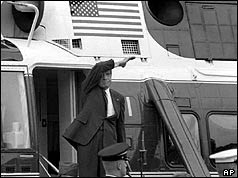 fue Nixon peor q el resto... de los americanos o de cualquier politico? da lo mismo: Nixon me atrae. Me atrae sus fracturas, sus paranoias, el sentir q nunca era del club de los privilegiados y elegidos, incluso cdo estaba en el poder. who hate you don't win unless you hate them, and then you destroy yourself. We think that when someone dear to us dies, we think that when we lose an election, we think that when we suffer defeat, that all is ended. We think, as T.R. said, that the light had left his life forever. Not true. It is only a beginning always. The young must know it; the old must know it. It must always sustain us because the greatness comes not when things go always good for you, but the greatness comes when you are really tested, when you take some knocks, some disappointments, when sadness comes, because only if you have been in the deepest valley can you ever know how magnificent it is to be at the highest mountain. 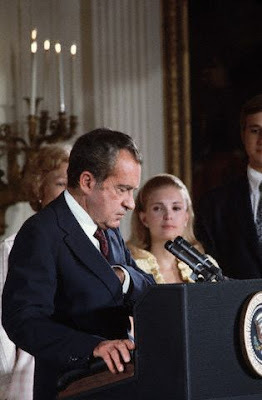 August 8, 1974 Farewell speech to the Nation. as they see it. But on our part, believe me, it is spontaneous. men and women who work for and with the President. are 1,000 years old or older. was rather sorry they didn't come down. We said good-bye to them upstairs. lift from them because I might be a little down, but they always smiled. Cabinet. I am proud of our sub-cabinet. I am proud of our White House staff. Mistakes, yes. But for personal gain, never. You did what you believed in. sacrifices that all have made to serve in Government. years ahead. With our leadership it will know peace, it will know plenty. in this Administration, no one single man or woman. lemon ranch. It was the poorest lemon ranch in California, I can assure you. He sold it before they found oil on it. [Laughter] And then he was a grocer. the hilt, regardless of what happens. seeing each of them die, and when they died, it was like one of her own. He said: "She was beautiful in face and from and lovelier still in spirit. always in the sunshine. There had never come to her a single great sorrow. my heart's dearest died, the light went from my life forever." strong, sometimes wrong, sometimes right, but he was a man.